How to set up a play area and configuration tips. 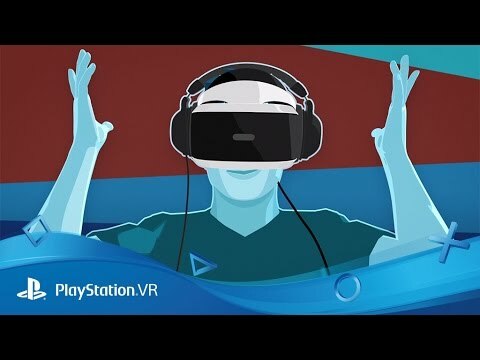 Make sure you configure PlayStation VR (PS VR) every time you play. This is because changes in player position or room lighting need to be taken into account. Take a 15 minute break for every hour of play or after watching a movie in Cinematic Mode. Sit down while you play. If you start to feel unwell or dizzy, stop playing right away and take a break. Make sure your headphones or earbuds are on or in the correct ears. Keep your controllers handy so you know where they are after you put the VR headset on. You need a space of at least 3m x 1.9m. Place your chair directly in front of your PlayStation Camera about 2m (6’) away. We recommend that you stay seated while playing, but if you are playing while standing, clear any tripping hazards from the play area and a buffer zone around it. Lamps (switch them off or dim them). Direct sunlight (close your blinds). LEDs on other devices (e.g. laptops). Mirrors catching the reflection of headset or controller tracking lights or off-camera light sources. Long press the PS button on your DualShock 4 controller to open the Quick Menu. Select [Adjust PlayStation VR] > [Confirm Your Position]. Bright lights show up as dark colours on this screen so you can switch them off or move them. If you are still experiencing tracking problems, see our Tracking Issues article for more help. Place the camera in a vibration-free location. Place your PlayStation Camera (PS Camera) about 1.4m (4’7”) from the floor. If you are using PlayStation Move motion controllers, try placing your PS Camera slightly higher than 1.4m (4’7”), as this can sometimes improve tracking. Try placing it on top of your TV screen. Stand or sit about 1.4m - 2m (4'7" - 6’) away from the PS Camera and play directly in front of it. Make sure the PS Camera can see the VR headset to stop ‘Out of Play Area’ messages. Long press the PS button on your controller to open the quick menu and go to [Adjust PlayStation VR] > [Confirm Your Position] and re-centre yourself in the play area. Try to reduce colours in the play area that match the colours of the lights on the VR headset (blue), DualShock 4 wireless controller (red, magenta and cyan) and PS Move motion controllers (red and magenta). This includes wearing clothes in contrasting colours to make sure the lights can be picked up. If the colour of the light on your controller is not being picked up go to the PS4 home screen and go to [Settings] > [Devices] > [PlayStation VR] > [Tracking Lights] > [Controllers] and press (X button) on any controllers you want to check. Your PS4 will check to find out if another colour will be picked up better by the PS Camera. If your DualShock 4 wireless controller is connected to your PS4 system with the charging cable, this can sometimes interfere with the PlayStation Camera's view of the light bar. Play wirelessly to stop this issue. Make sure the lenses are clean using the supplied microfiber cloth. Make sure the lenses are clean using the supplied microfiber cloth when you start a new game session or switch player. If you notice that the image is not clear during play, long press the PS button on your DualShock 4 wireless controller to open the Quick Menu and pause gameplay. Select [Adjust PlayStation VR] > [Adjust Headset Position] and move the headset until the image is clear. Adjust the brightness of the PS VR Headset in the same menu before play. This won’t affect the brightness of your TV display. If the screen shifts to one side, press and hold the Options button on your DualShock 4 wireless controller to re-centre the screen. At times the camera may not properly track the position, direction, or movement of your VR headset or controller. Position your camera so that it properly recognizes your face. Adjust the lights on your VR headset or controller so that the camera can properly track them. When you pause a VR-compatible game and the PS4 system home screen appears, the quality of the video output to your TV will be temporarily reduced. This is expected. Image quality will return to normal when you quit the game. You can wear the VR headset over your glasses but take care when adjusting the scope. Having your glasses touch the lens could result in damage to your glasses, VR headset lens or both. Do not push in or pull out the scope excessively. If you notice that PS VR environments are unclear or fuzzy while you’re wearing your glasses, try taking them off and readjust the scope position before you start play. Try playing with and without your glasses to find out what works best for you.